Big fan of The Office. Found this website this week and it made me laugh. If you know me I love to laugh and make other people laugh. I think I am kind of addicted to laughing. So glad God made it and thankful for the Comedy channel fueling it. 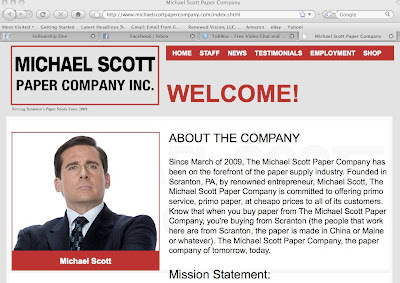 Anyway click on the MICHAEL SCOTT PAPER COMPANY scree shot above and enjoy! Hope everyone has a good weekend. Oh, if you missed The Office last night, I think it was one of their best episodes! Go to NBC.com and check it out. I just want to tell you that I’m beginner to blogs and definitely enjoyed you’re web site. Likely I’m going to bookmark your blog . You definitely have tremendous well written articles. Many thanks for sharing with us your blog. I¡¦ve been exploring for a bit for any high-quality articles or blog posts in this sort of area . Exploring in Yahoo I ultimately stumbled upon this site. Studying this info So i¡¦m satisfied to exhibit that I’ve a very just right uncanny feeling I came upon just what I needed. I such a lot undoubtedly will make certain to don¡¦t put out of your mind this web site and give it a glance regularly. naturally like your web-site but you need to test the spelling on quite a few of your posts. Many of them are rife with spelling problems and I to find it very troublesome to inform the truth on the other hand I will surely come again again. An amazing content! It’s a 100 pure enjoyment to browse it. Congratulation! Well done! I am holding out for additional texts. I¡¦m no longer positive the place you are getting your info, however good topic. I needs to spend some time learning more or working out more. Thank you for magnificent info I was on the lookout for this info for my mission. Whats up very nice site!! Man .. Excellent .. Wonderful .. I will bookmark your website and take the feeds also¡KI’m satisfied to find a lot of useful info here within the put up, we need work out more techniques in this regard, thanks for sharing. . . . . . I simply want to mention I am all new to blogging and really loved this website. Probably I’m likely to bookmark your blog . You actually have outstanding stories. Bless you for sharing your website. Hiya, I am really glad I’ve found this info. Today bloggers publish only about gossips and net and this is actually annoying. A good site with interesting content, that is what I need. Thank you for keeping this site, I’ll be visiting it. Do you do newsletters? Can not find it. Helpful info. Lucky me I found your site accidentally, and I am shocked why this accident didn’t happened earlier! I bookmarked it. Great remarkable things here. I¡¦m very glad to see your article. Thank you a lot and i am having a look forward to contact you. Will you kindly drop me a mail? Helpful information. Lucky me I found your web site by chance, and I’m shocked why this twist of fate didn’t came about earlier! I bookmarked it. I simply wished to appreciate you all over again. I am not sure what I would’ve worked on without these thoughts contributed by you concerning such a theme. It truly was a real hard dilemma for me, however , looking at a skilled manner you resolved the issue forced me to weep over happiness. I’m just thankful for this guidance and then have high hopes you comprehend what an amazing job your are undertaking educating the rest using your web site. I’m certain you haven’t come across all of us. I needed to post you this little note in order to give many thanks over again for your personal extraordinary suggestions you have featured at this time. This is so shockingly generous with you to provide publicly all most people would’ve distributed for an e book to end up making some profit for themselves, especially since you could possibly have tried it in case you decided. Those creative ideas in addition acted as a good way to understand that other people have the same fervor just as mine to find out way more with respect to this condition. I am certain there are numerous more pleasurable periods in the future for people who scan through your blog post. I precisely wanted to say thanks once again. I am not sure what I would’ve taken care of without the tips provided by you regarding this area of interest. It truly was a frustrating issue in my position, however , finding out the very skilled mode you managed it made me to cry with fulfillment. I am just happier for this support and in addition have high hopes you really know what a powerful job you happen to be providing educating men and women via your blog post. I’m certain you haven’t met any of us. I wanted to jot down a simple remark so as to appreciate you for some of the great pointers you are posting on this website. My prolonged internet investigation has at the end of the day been honored with useful suggestions to go over with my friends. I would assume that we site visitors are undeniably blessed to dwell in a fabulous network with very many awesome professionals with beneficial tips and hints. I feel quite blessed to have discovered the site and look forward to tons of more awesome moments reading here. Thank you again for all the details. Wow, amazing blog structure! How lengthy have you ever been blogging for? you made blogging look easy. The whole glance of your website is fantastic, let alone the content! I needed to write you this very small observation just to say thanks a lot once again just for the lovely suggestions you have shown in this case. It is extremely generous with you giving unreservedly just what a lot of people would have sold for an electronic book to help make some profit for their own end, notably since you might have done it in the event you desired. These secrets additionally worked as the good way to be certain that someone else have a similar passion just as mine to see a good deal more regarding this issue. I believe there are thousands of more pleasurable opportunities up front for those who discover your blog. I simply needed to thank you very much once more. I’m not certain the things that I could possibly have made to happen in the absence of the opinions contributed by you regarding my industry. It was before the horrifying issue in my opinion, nevertheless taking a look at this specialized strategy you processed that made me to jump over happiness. Extremely happy for your work and pray you are aware of an amazing job you were getting into training people today thru your webblog. More than likely you have never got to know any of us. My wife and i have been now fulfilled that Louis could finish off his homework while using the ideas he received using your web site. It is now and again perplexing to just be giving out guidance that many other folks might have been selling. And now we know we have you to appreciate because of that. Most of the illustrations you made, the easy web site navigation, the relationships you will give support to foster – it’s mostly excellent, and it’s really helping our son in addition to us reckon that the concept is amusing, which is certainly very indispensable. Thanks for all the pieces! I have been exploring for a little for any high-quality articles or blog posts in this sort of area . Exploring in Yahoo I eventually stumbled upon this website. Reading this information So i¡¦m happy to show that I’ve a very excellent uncanny feeling I found out just what I needed. I such a lot indubitably will make certain to don¡¦t overlook this web site and provides it a glance regularly. Someone essentially assist to make severely articles I might state. That is the very first time I frequented your website page and thus far? I surprised with the analysis you made to create this actual publish extraordinary. Wonderful task! I have read some just right stuff here. Certainly value bookmarking for revisiting. I surprise how so much attempt you place to make one of these wonderful informative site. I like this web site very much, Its a rattling nice position to read and obtain info . “No one wants advice — only corroboration.” by John Steinbeck. Whats Taking place i’m new to this, I stumbled upon this I have found It positively useful and it has aided me out loads. I’m hoping to contribute & aid other users like its helped me. Great job. ohbxqkkgxw,If you are going for best contents like I do, just go to see this web page daily because it offers quality contents, thanks! fantastic publish, very informative. I ponder why the opposite specialists of this sector do not understand this. You must proceed your writing. I am sure, you have a huge readers’ base already! Thank you for sharing excellent informations. Your web site is very cool. I’m impressed by the details that you have on this web site. It reveals how nicely you understand this subject. Bookmarked this web page, will come back for more articles. You, my friend, ROCK! I found simply the information I already searched all over the place and simply could not come across. What an ideal site. of course like your web-site however you have to check the spelling on quite a few of your posts. Several of them are rife with spelling problems and I in finding it very bothersome to inform the truth on the other hand I’ll certainly come again again. Thank you, I’ve recently been searching for info approximately this topic for a while and yours is the greatest I have found out till now. But, what about the bottom line? Are you sure concerning the source? bebmevmhl,Some really nice stuff on this website, I enjoy it. You have mentioned very interesting details ! ps decent website . “Every man over forty is a scoundrel.” by George Bernard Shaw. I just could not depart your website before suggesting that I actually enjoyed the standard info an individual supply for your guests? Is gonna be again ceaselessly in order to inspect new posts. zropveqmnux,Definitely believe that which you said. Your favourite justification appeared to be on the net the simplest thing to remember of. cutlwayta,Thanks for ones marvelous posting! I actually enjoyed reading it, you will be a great author.I will always bookmark your blog and will eyaujh,come back from now on. I want to encourage that you continue your great writing, have a nice afternoon! pvnvnwqlxx,Your blog was informative and valuable to me. Thanks for sharing.